Good to Great: Why Some Companies Make the Leap… And Others Don’t is a Jim Collins classic that shares an eye-opening study on how top companies managed to manifest great results and maintain them for more than a decade. After the study was completed, Collins found key business traits and strategies that transformed these companies into successful, elite companies. Step 1: Reach Level 5 Leadership. Level 5 Leadership, a concept developed by Jim Collins and revealed in his book, is the top spot on the corporate ladder: the executive. And that’s where you want to be with your content marketing. As an executive in a company, you have a vision, and that vision is shared with others. To share your vision, you’ll need the right people to help create your vision and manifest it. It’s the same process with your content marketing strategy. You need the right people to help you create content, no matter what type of content you plan to use. If you want your own unique images for content you create, you need a designer. If you want your content to be flawless, you’ll need an editor on your team to comb through each content piece. If you have lots of content you want to write, but don’t have the time, you’ll need multiple writers. To be a Level 5 Leader, you need to have a vision and be able to communicate your vision to other people who join your content marketing team. They need to know what you expect from them. That’s why your content marketing strategy needs to be detailed. You need to know what you want to do for content marketing before you can pass on your vision for others to handle. The first step to developing a good-to-great content marketing strategy is knowing what you want. Step 2: Know the who first, then the what. To get your content noticed, you need to identify your target audience and market your content to them. You’re providing valuable content to them, not just building your brand’s image. You need to know who you’re marketing to first before you can decide on what type of content to create and offer to your target market. When identifying your target audience, be specific. Let’s say your target audience is moms. Take it a step further: Do you want to target stay-at-home moms or working moms? First-time mothers or experienced mothers? Young mothers or moms in their 40s? Once you’ve figured out your target market, you need to get involved with the group and learn about the people in that specific group. What do they need, but aren’t getting? What information are they hungry for? What matters to them? Where do they hang out most of the time (e.g., online forums, social media groups, etc)? Research your target audience to determine what type of content you want to provide. Step 3: Confront the brutal facts. Being honest with yourself may be challenging for you. In order to make your content marketing strategy a success, you need to face the facts. Even if you think a content piece you’ve created rocks, your target audience may not find it useful at all. Don’t let that get you down, though. Being honest not only helps you come up with better content ideas, but honesty will also help save you time. If you blindly create content and share it without thinking about its effectiveness, you only waste your time and energy on something that won’t work for your vision. Be honest with your situation right now. Do you have content ready? Do you know exactly what you want to do for your content marketing? Do you have content created by other people you’ve hired, but it’s not any good? Know where you’re at with content marketing, and figure out what you need to do to move forward. Would I share this content with my customers? Would they think it was a useful piece? 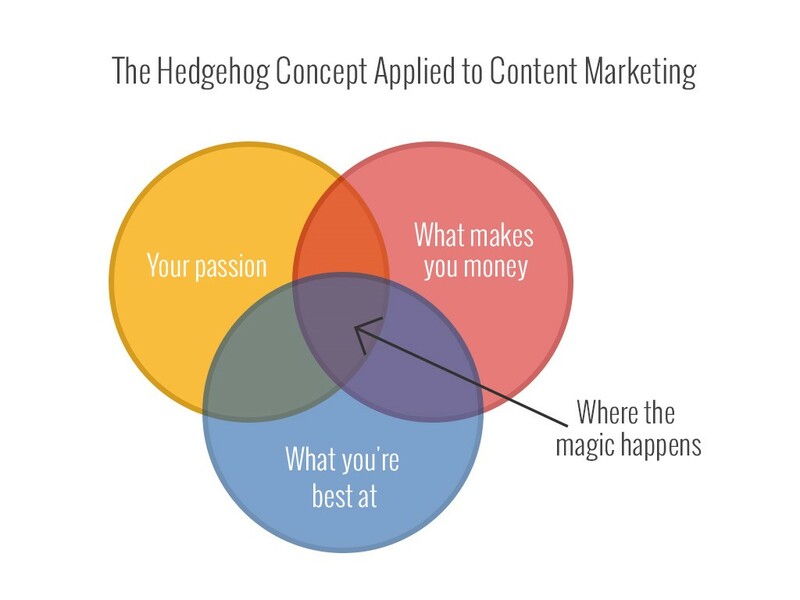 Step 4: Understand and apply the Hedgehog Concept to your content marketing strategy. Three circles, one focus – these are the components that make up the Hedgehog Concept. According to the Hedgehog Concept, companies are more likely to succeed when they focus on one main goal; in this case, your vision or goals for content marketing. One focus is better than going in different directions at the same time. When the three circles overlap, they have a single focal point. Everything ties in together, and a single focus point maintains consistency in a company. To stand out from the crowd, a company’s image needs to be consistent. It’s the same for content marketing. You can approach content marketing in countless ways. The key is knowing what works for you and your company? You don’t have to join every content marketing bandwagon out there; narrow down your content marketing tactics, and focus on ones that match your vision. To apply the Hedgehog Concept, self-reflect and brainstorm with others (e.g., team members or higher-ups in your organization). Your passion, your best skill(s), and your driving force all need to be considered and ring true with your vision. Write down these three details, and use it as a guide for your content marketing strategy. With these details, you’ll maintain a consistent message in your content pieces and make it easier to create an effective content marketing plan. Here’s an example of the Hedgehog Concept in action: Sarah is a certified accountant and wants to open her own consulting business. She also wants to create a financial help blog to give people professional, effective advice and other information on handling their finances. What lights your fire? I love helping people have healthier financial lives and teaching them how to take control of their money rather than letting their money take control of them. What could you be best at? I could focus on becoming an expert in personal finance instead of having a variety of clients who need financial help in different areas. Personal finance can be my field, and I can train myself to be the best at it. What makes you money, or what do people pay you for? Most of my clients need help with understanding finance in general or how to manage their own personal finance issues. I help them solve any problems they’re having. With the details written out, Sarah has her vision for her financial consulting business. Based on her answers, she creates a content marketing strategy that includes financial FAQ videos, blog posts featuring personal finance tips and other related information, and infographics. Her blog’s focus is personal finance; she’ll offer her services as well as free, helpful information to people who are looking to better their personal finance. Groove is an example of a company that is providing an overlap across these three spheres. Their CEO, Alex Turnball, is passionate about startups and entrepreneurship. The makes money by helping companies improve customer support and his team is really good about executing on customer needs and building the product based around his customer’s feedback. By building a blog around transparency, he’s able to appeal to entrepreneurs. He did the right things initially to get on the radar of influencers that would promote his content, and in turn promote his business. Step 5: Be consistent and disciplined with content marketing. What’s the key to content marketing success? It’s consistency. If you want to achieve your goals with content marketing, you need to be consistent. You need to have a schedule that supports a consistent content marketing strategy. Even if you have a ton of great content ideas lined up and ready to go, you still need to continue publishing valuable content for your target market. I have a daily goal of writing 750 words. I do this first thing when I wake up and it takes me maybe 30 to 45 minutes (I write about my complete routine here). It’s really easy to write about something you’re good at and passionate about. There are no shortcuts, you (or someone on your team) just has to do it. Step 6: Gather your technology accelerators. Letting your audience know about your content is the next big step for your content marketing strategy. To help you promote your content and get your content seen, get the right tools for your marketing toolbox. Buffer – A convenient, time-saving tool for social media posting? Yes, please! Buffer App does the job for you when it comes to social media marketing. All you need to do is type up and add your posts in the queue, and Buffer will send them out for you. Let’s put Buffer into action: Sally, a business consultant, wants to grow her business by building a blog. She already has a collection of blog posts created and ready to share. However, she wants to share them at different times, not all at once. Sally uses Buffer to schedule her posts throughout the week to keep her social media followers excited about the next post she’ll share. She also keeps a consistent, predictable schedule for content sharing to help her prospects and clients keep track of new content easily. Buffer isn’t just for stocking up your tweets; it also allows you to manage posts across several social media platforms, giving you a single area where you can update all your social media pages. Workado – Manage all your content marketing campaigns with ease by using Workado! Created for marketers by marketers, Workado is an easy-to-use marketing management system that helps you organize tasks, keep your team members up-to-date on projects, and improve client relationships. It was a solution I needed when I was running a growing agency and I decided to make it available to other agencies as well. Let’s take Matt’s situation for example. Matt’s marketing business is starting to grow, and that means his team is growing, too. He needs a way to manage not only his team members and freelancers he works with, but also his clients’ marketing campaigns. Matt’s also looking for a way to provide better service for his clients. By using Workado, Matt keeps all marketing campaigns and communicates with all his team members and freelancers in one place. He also uses Workado’s unique activity logs to provide clients with regular updates on what he and his team have done for them during the month. CoSchedule – If you’re using a WordPress website for all your content, CoSchedule’s going to be your next favorite plugin! CoSchedule is an editorial calendar app that integrates with WordPress. You’ll have a way to keep track of content publishing dates and content marketing tasks right on your WordPress website. What’s neat about CoSchedule is you can also create social media posts and publish them at the same time when you publish new content. If you create content throughout the day, you can update your social media pages at the same time. You can also schedule posts and publish them automatically on different days. CoSchedule is team-friendly, so you can include team members on your CoSchedule account and keep everyone updated through the editorial calendar. On top of that, you can integrate CoSchedule with the Buffer App to give you more functions and flexibility for posting content and social media messages. Udemy – If you want to reach more people or re-purpose blog posts or other content pieces, turn your content into videos and offer them as courses at Udemy. Online learning has become a big part of education, and Udemy can take your content to a whole new level. With video courses, you can give your audience a more in-depth version of popular content pieces you’ve published. Udemy allows you to provide free or paid video courses, so this platform is a great way for you to create content in a different format and keep content fresh. Visual.ly – Visual content is a fantastic way to share information fast. An appealing infographic or an exciting video can take your content further faster, and Visual.ly connects you with visual content creation teams who can make your content come to life. You can freshen up old content pieces and give it a new life through an infographic, or do what Buffer does and include infographics in your post. You can create campaigns with Visual.ly as well and maximize your content marketing efforts. You can have presentations made for future webinars or even Udemy video courses. With Visual.ly, you can expand your content creation strategies and find inspiration for future content pieces. Step 7: The Flywheel Concept and how it applies to content marketing. The Flywheel Concept, developed by Jim Collins, is based on, well, a flywheel. If there isn’t anything exerting force on the flywheel, it won’t move. Once the flywheel starts moving, it gains momentum and speeds up before you know it. The Flywheel Concept is similar to a snowball rolling down a snow-covered mountain. The snowball starts out small, but as it gains speed, it goes down the mountain faster and grows bigger. This concept can be applied to content marketing. The more you do for your content marketing efforts e.g., outreach, content creation, editing, and social media posting, the bigger and better results you’ll get in the long run. It’s like watching a small business grow into a large company. At one point, every big company started out small. But with the right, consistent marketing for their brand, services, products, etc., these companies continue to attract prospects and customers. Take HubSpot for example. HubSpot’s blog attracts not only marketers, but agencies and salespeople. With the various content HubSpot provides on a regular basis, more people come to HubSpot for more information on topics that relate to them and their businesses. This means a larger audience for HubSpot’s blog. That’s why it’s crucial for you to be consistent with content marketing. You start out with a small snowball, but when you roll it down the mountain, you’ll end up with great results. Be prepared, though – make sure you continue to track progress and adapt to changes as they come along. In Jim Collins’ book, Good to Great: Why Some Companies Make the Leap… And Others Don’t, leadership and management systems in companies are heavily focused on. When it comes to content marketing, leadership and management are just as important. You’re the leader of your content marketing strategy, and you’re the one who controls the writing process from the inside while being an influential individual on the outside. So what do you need to do now? Have a BHAG – big, hairy, audacious goal. Get organized, and develop your content marketing plan around that goal. Follow the seven steps for good-to-great to enhance your plan. Additionally, you can also use our new step-by-step strategy guide with template. Take time to plan tactics you want to implement in your content marketing strategy and what you need to do to make your vision become reality. Lastly, aim to influence! Justin McGill is the author of Self Made Marketer, a roadmap for people wanting to grow and scale a digital marketing agency. He is the founder of Workado (allowing marketers to manage multiple client campaigns) and LeadFuze (a B2B lead generation service).